The day we've hoped for has finally arrived! Well, actually it's passed, but no matter. Drunk History is back! As part of the premiere episode of HBO's sketch comedy show, Funny or Die Presents, there was a new drunk history lesson on the meeting of Frederick Douglass and Abraham Lincoln. As with past Drunk History films, the historic events are enacted by recognizable actors, in this case Don Cheadle (Douglass), Will Ferrell (Lincoln), and Zooey Deschanel (Mrs. Lincoln). And once again, the history value is dubious, but the alcohol content is high. Previous Drunk History videos have been available in full length on the Funny or Die Website. Unfortunately, only a taste of the new short has appeared online (embedded above). If you want to see the entire short, you'll have to tune into Funny or Die Presents on HBO. The premiere episode will be repeated several times beginning Tuesday, so check your listings or set your DVR. By the way, the Douglass and Lincoln short recently won a jury prize for short filmmaking at this year's Sundance Film Festival. Another Drunk History short, Tesla and Edison, starring John C. Reilly and Crispen Glover was also entered in the competition, so that short will likely turn up on a future episode of Funny or Die Presents. For our coverage of the earlier Drunk History shorts, click HERE. The wheels of progress are constantly spinning, and Booze Movies is spinning right along with them (although I imagine that the spins are due at least in part to the whiskey). 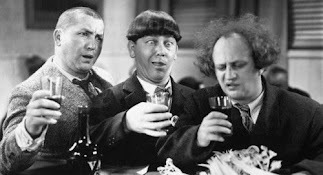 Nonetheless, today Booze Movies has joined the social networking revolution (huzzah). You can now find us on Facebook. The main reason for this development is to spread our reach and make more people aware of the role that fermented fluid has played in film history. However, there are reasons that Booze Movies regulars may also choose to join the Facebook fan page. You can post feedback, share soused cinema photos, request movies to be reviewed, add discussion topics, or spread the Booze Movies love by suggesting the site to your Facebook friends. To join our Facebook page, click on the link next to our favorite boozy beauty, Marion Ravenwood. By the way, if you want to keep up with happenings here at Booze Movies, click the "Follow" link on the navigation bar above or the "Follow" button in the "Followers" section on left. 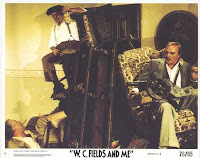 W.C. Fields often resorted to taradiddle when relaying the story of his life. He was always more interested in telling an engaging story and getting a good laugh than in sticking strictly to the facts. Consequently, it wasn’t surprising that when a biopic of the Great Man was produced that it would bend the truth a little. However, not content to simply bend the truth, the producers of W.C. Fields and Me, twisted the truth into knots, locked it in a trunk, shot it full of holes, ran it over, and left it bleeding on the side of the road. 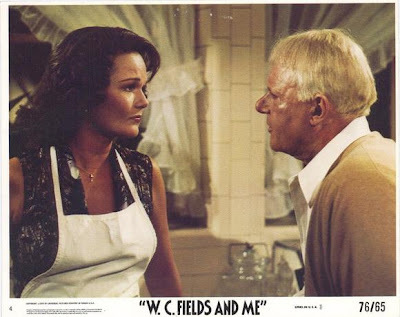 Based loosely on the discredited and self-serving memoir of Fields’ mistress, Carlotta Monti, W.C. Fields and Me is almost entirely a work of fiction. Worse yet, it is a drab, uninteresting work of fiction that contains none of the Great Man’s flair for humor or for spinning a good yarn. The film skips Fields’ childhood and his years on the vaudeville circuit as an eccentric juggler and begins when the comedian (Rod Steiger) was starring in the Ziegfield Follies. From that point forward, the banana oil is spread is huge strokes. After being fired from the Ziegfield Follies for not sticking to scripted material (never happened) and losing most of his money to a crooked broker (also untrue), W.C. Fields talks his diminutive pal Ludwig (never existed) into staking him to a trip to California. The comedian and midget (Billy Barty) take over the operation of a wax museum (a complete fabrication) while Fields tries to enter the movie business by writing scripts for films that he wouldn’t make for another ten years (unadulterated hooey). Fields’ scripts get him noticed (nope) by Paramount studios and he is offered a part in a movie. Through a montage of movie title cards (shown out of chronological order and including many of Fields later pictures made at Universal) Fields’ star rises at Paramount. 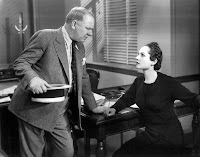 While many details of Fields’ true life story were unknown at the time that W.C. Fields and Me was made, it is baffling why the producers were so determined to get even the most obvious facts wrong, such as shuffling the order in which the films were made or in depicting Gregory LaCava as the director of movies actually directed by Eddie Sutherland. It also makes no sense why the screenwriter would choose to invent melodramatic soap opera when the events of Fields’ real life were much more interesting. The movie completely ignores the Great Man’s rocky career in silent films, the illness that kept him off the screen between 1936 and 1938, his radio feud with Charlie McCarthy, how the timing of his return to films kept him from accepting the role of the Wizard of Oz, censorship skirmishes with Universal, the battle of egos between Fields and Mae West, etc. Many of the picture's inaccuracies could easily be forgiven if it correctly captured the spirit of the comedian. 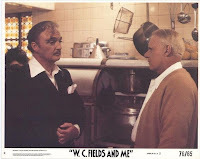 Unfortunately, though Rod Steiger tries to keep his portrayal of Fields from becoming a caricature, his performance suffers from the fact that he is singularly unfunny. Of course, Steiger isn’t helped by the fact that the script chooses to avoid using any the Great Man’s classic stage and film material and instead substitutes sub par hokum. It is a shame that the funniest man to ever stagger in front of a movie camera was saddled with such a mirthless biopic. 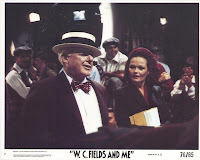 A Note--If you are interested in the real Fields, I’d highly recommend James Curtis’ definitive book W. C. Fields: A Biography. 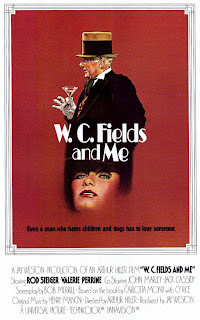 The documentary W.C. Fields Straight Up also presents a satisfying, well-rounded portrait of the Great Man. By the way, a picture of the real W.C. Fields and Carlotta Monti is presented to the right of this paragraph. Potent Quotables--FIELDS: (Sneaking a swig from a bottle before filming a scene) Mm. Like blood to a vampire. Video Availability--W.C. Fields and Me has never been released on video, but Yammering Magpie Cinema has a collectors copy available on DVD. The DVD is full frame and the video quality is variable (Yammering Magpie’s site ranks the video quality a “B”). Still, this collector’s copy may be the only way you’ll ever see this rarely screened flick. Similarly Sauced Cinema--Donald O’Connor stars in The Buster Keaton Story (1957), another mostly fictional biopic about a comedy legend who had his problems with drink.